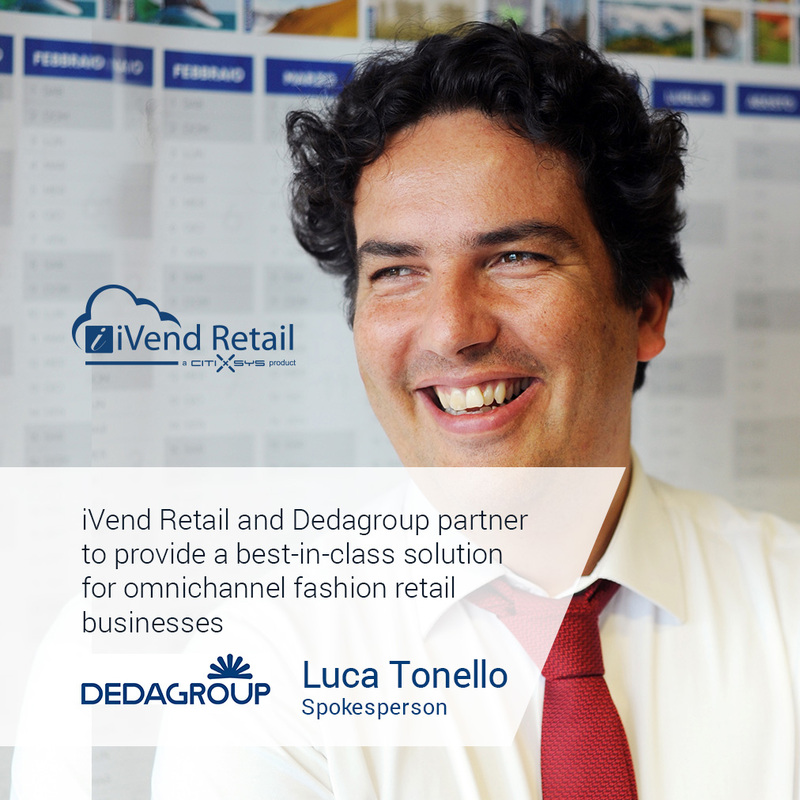 09 March 2016 – Watlington, Oxfordshire, UK – Global integrated retail solution brand, iVend Retail, today announced its partnership with Dedagroup, one of Italy’s largest IT systems providers to fashion and luxury retailers. The strategic alliance sees iVend Retail’s retail management suite and Dedagroup’s Stealth platform combine to deliver a fully integrated solution, which allows retailers to digitise their operations to better meet the needs of customers that shop across channels. With extensive experience in implementing digital transformation, Dedagroup’s solutions deliver the software eco-systems needed to underpin fashion retailers’ omnichannel strategies. Through its Stealth solution, created to support the fashion and luxury companies in their key processes, it offers optimum control of all of the stages of production, logistics and distribution that comprise fashion and retail businesses. The suite allows the integration of data into one system and a single database and the uniform management of the entire value chain. Stealth also guarantees constant control of distributed production processes and the management of multi-brand, multi-lingual and multi-company issues. The iVend Retail management suite is an integrated solution, which allows retailers to better manage their enterprise operations – across channels, across geographies and across devices. Affording retailers a 360 degree view of the customer – no matter which channel they choose to shop in – combined with a single view of inventory , iVend Retail helps brands redefine omnichannel retailing enabling them to drive greater conversions and deliver the intuitive experiences multichannel shoppers demand. The integration of Stealth with iVend Retail provides end-to-end benefits to the retailer, from supply chain procedures through to fulfilment and the management of customer experience both at the point of purchase and beyond. Together, iVend Retail and Dedagroup will provide customers with a flexible, fully integrated platform that will open new technologies and workflows, enabling them to deliver seamless shopper journeys and increase customer lifetime value through improved retention. “Technology is a key enabler for bridging these experiences, and our partnership and combined expertise provides a best-in-class, future-fit solution which addresses retailers’ omnichannel challenges, enabling them to retain and delight customers and differentiate themselves from competitors,” Kolodynski, concluded. With a turnover of €220 million, 1,600 employees and more than 3,600 clients, Dedagroup is one of the largest Italian-owned IT groups. We support enterprises, public institutions and credit institutions in their IT and digital strategies with expertise in applications, technology and system integration. Through our Fashion, Factory & Retail Unit we sustain retailers of scale and world-renowned brands in their digital transformation journey, helping them to manage logistics, distribution and production processes , also integrating the different sell channels. Founded in 2008, the group has always experienced steady growth, internationalising its operations in Mexico, the US, Europe and the Middle East. The headquarters is located in Trento with branches in Italy and abroad.